The Mornington Peninsula packs a lot into a compact area that’s under two hours from Melbourne. Here you can experience everything from coastal culture, wartime history, fertile plains and peninsulas to food and wine that’s world-class. 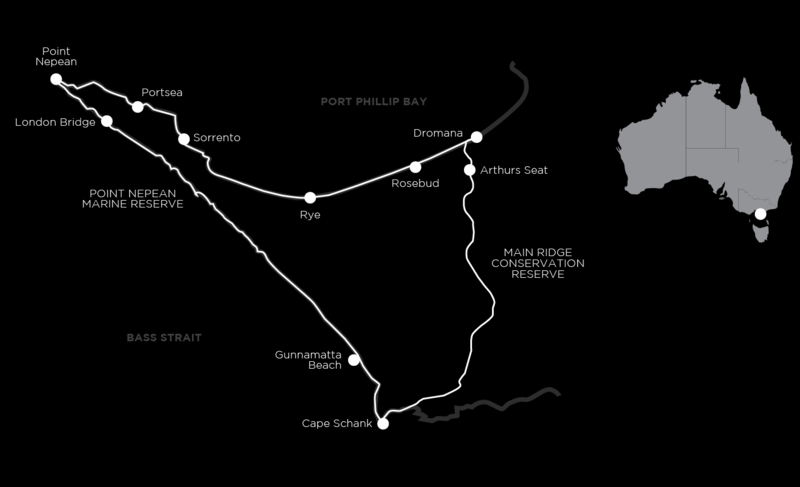 There are four distinct sections to this 100km continuous circuit track. Start with the Two Bays Track, which crosses the widest section of the Mornington Peninsula leading to its highest point at Arthur’s Seat. A gentle descent through inland forest leads to the serene Bushranger Bay where you can expect to see kangaroos and even spot a koala. The coastal hike section features cliff-top walks with dramatic views, rugged beach stretches, coastal forest and Cape Schanck Lightstation on the southernmost tip of the Peninsula. Cape Schanck is known to have some of the cleanest air around, leading CSIRO scientists to bottle it, after gale-force winds blow uncontaminated air directly from the Antarctic. The Point Nepean section includes fascinating wartime relics including historic forts. You can explore the tunnels of these forts for a first-hand glimpse of what life would have been like for the thousands of soldiers based here during wartime. Watch these Mornington Peninsula walks being featured on an episode of Eat Play and Stay in 2015. You might like to incorporate in a rest day at the Cape Schanck area or at Sorrento where you can take the ferry across to historic Queenscliff for the day or visit the hot springs or the wineries. Start in Dromana any time after 2pm. If you arrive early enough you can enjoy a visit to the historic Heronswood property or a stroll on the bay beach in the direction of Mt Martha. The first of the Mornington Peninsula walks is an easy stroll on the bay beach before climbing up through native bushland on the Two Bays Walking Track to Arthurs Seat. You can see all the way to the other end of the peninsula from here. Then descend to Greens Bush area. Continue along the Two Bays Walking Track to picturesque Bushranger Bay and then via the cliff tops to Cape Schanck Lightstation. There’s a scenic walk to the point here and you can also take a tour of the lighthouse and stroll through the lightstation precinct (at extra cost). From Cape Schanck, the Mornington Peninsula Walk continues along rugged cliff tops and remote surf beaches. Watch the surfers brave the water no matter what the temperature is. Sometimes you’ll see dolphins playing in the waves as well as numerous seabirds. Continue along the back beach via Sorrento and Portsea to Point Nepean. This is the very tip of the peninsula where you can see across The Rip to historic Point Lonsdale. Marking the entrance to Port Phillip Bay, here you can explore historic forts, walk through the tunnels used during the World Wars and see large disappearing guns. There’s a shuttle bus you can take to get back to the entrance to Point Nepean park (at extra cost). Finish the day with a stroll along “Millionaires Walk” and see how the peninsula’s well-heeled live. The final section is the Bay Trail from Sorrento back to Dromana via jetties, idyllic swimming spots and rows of colourful bathing boxes. The track hugs the bay beach, alternating between walking track and beach walking. In the summer months campers and picnickers line the beach, but at other times of the year you’ll have long stretches all to yourself. There are historic ruins to explore, the McCrae Lighthouse and lots of opportunities to stop for some window shopping or gourmet treats. This trip finishes in Dromana after breakfast. The tracks are reasonably well graded and are easy to negotiate. Full day walks average about 15km. There are great opportunities for really fit walkers to challenge themselves on most days. Throughout this 100km circuit, we’ll put you up in comfortable hotels and resorts. The first and last night’s accommodation is at Dromanna Hotel, then we move to the Fairways Resort and then finally onto the Sorrento Hotel. All of the rooms have their own ensuite and are located in convenient locations to limit your travel time in a vehicle. On some of the days you are walking in and out of accommodations from the track. The two course a la carte dinners and cooked breakfasts are all prepared by professional chefs. The Mornington Peninsula has a well-earned reputation for fine food and wine along with great health and wellness experiences. We’ve chosen accommodation that affords you the opportunity to indulge along the way. You won’t feel guilty either, with all the mileage you’ll have racked up. We suggest taking a day off to visit the renowned local wineries and hot springs or simply take in a long lunch. This walk starts and finishes in Dromana, approximately 80km from Melbourne. You can leave your car here to collect at the end of the walk. There are regular train and coach services from Melbourne, although airport shuttles or private transfers are quicker and more convenient. Contact us for more detail. This walk covers almost 95km averaging 18.5km per day. The walking is mostly easy to moderate with a small amount of more strenuous walking. There is some extended beach walking on soft sand, some scenic clifftop walks, undulating tracks, and the occasional short steep climbs. The walk is a relatively easy grade but a long one at almost 100km. The summer months from January to February can be quite hot. March to May are usually delightful for walking, as is September to December. The winter months from June to July can be cool and occasionally wet but offer exciting beach walking. Warning about tide times – this walking holiday includes some sections of beach walking, so you need to take into account the tide times when choosing a starting date. To check tide charts, go to the Bureau of Meteorology and select the pin for Around Western Port (Stony Point) and then Flinders Jetty for the location. Where you are walking in Gunnamatta will be 7 minutes earlier than these tide times. We can assist you if you need help understanding the charts.